Yep. You saw that title right. Remember when I made this citrus cleaner? 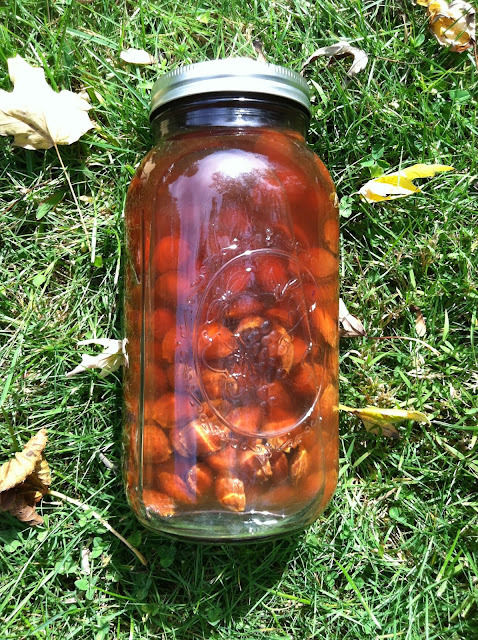 Well, this summer when I was up to my elbows in apricots, and their pits, I considered making that pit liqueur, Noyaux. As you might know, apricot pits (and cherries) are related to almonds, and impart an almond flavor when steeped. But, do you know how many little jars of strange liqueurs I have? And, you know, they just sit there. Because for the most part, I'd rather have a glass of wine at the end of the day than fussing with a cocktail, truth be told. But all those pits! What to do with them? I don't throw anything out unless I know I can't do anything with them. So, I did what any crazy preserver would do: I filled a half-gallon jar with the pits and covered them with white vinegar. I stuck it in the basement and forgot all about it. Almost three months later I've given them a sniff and have declared them a success. Now along with my sour orange cleaner, I also have the option of an exquisitely almond-scented cleaner. The vinegar is a subtle secondary tang to the primary almond scent. And I love that smell! I guess I could dress a winter salad with it as well---maybe a wilted greens salad with toasted nuts and some figs? P.S. Do you know how hard it is to make a jar filled with pits and brown liquid look pretty? P.P.S. As EL notes in the comments below, there is some controversy whether apricot pits are good or bad for you. Click over to the link for the liqueur above for more information on that topic. That made me laugh, but you are SO right. Both fabulous ideas! You should probably be careful. My mother used to preserve cherries with the pits in and then one day she found herself getting dizzy after eating them. I guess that batch had a bunch of cyanide in them. . . After that, she was more careful (or maybe she ate fewer at a time). They did taste wonderful though and I never got dizzy. At any rate, what a cool thing to do with pits! Of course I've been hoping that my plum pits will germinate in the compost heap and I will have a free plum tree. At least everyone says that they should do that. They do look kind of brown. Maybe plum pits would be more aesthetic? I think I'm with you on the cocktails -- I'm fine with them if someone else takes the time to make them!! I think I would use them as a cleaner. The next time I do plums, maybe I'll try it. Or one could have a mixed pit cleaner (apricots, cherries, plums. . .). I much prefer that smell to lavender (which gives me headaches). Good point, EL, I forgot to include information about the questionable apricot pit and it's cyanide-laced kernal. Check out the link to the Noyaux liqueur, where there's more talk about that. I still feel that the amount of pits is so negligible that a splash of this vinegar in a drink or a dressing or a poaching liquid would not do a thing. I think I read somewhere once that you would need to eat 72 pit kernals to make the cyanide amount to anything. But still, duly noted! I'm not sure plum pits would offer the same scent--I think it only applies to cherry and apricot pits. Oh, would that the compost sprouted fruit trees! I would have a huge orchard! What a great idea! I use vinegar to clean and come December when I've finished making apricot jam I will have a billion, trillion pits to dispose of! And as for wishing that things sprouted in compost bins - my sister has acquired a potato plant, my Mum a tomato plant, and birds freely distribute apricot pits (that then sprout into miniature apricot trees before I pull them out!) all around my garden. Given my small backyard, I'm somewhat glad my compost pile just behaves itself! Ha! I get loads of volunteers, but never any apricot trees. I think I would like that! Thanks for taking the time to say something, Christine!